The toys, treats, bags of food and cleaning agents -- when you bring a pet into your home their essentials invade your space. With over 69 million American homes owning one or more pets, ALNO has created the PetCenter - a unique cabinet system designed to contain all your household pet needs. 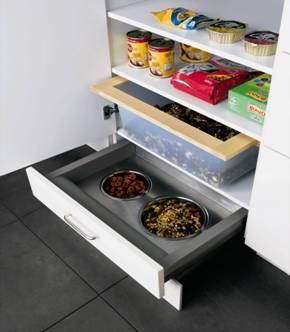 With compartments and shelving for both canned and dry food, and the hide-away food and water bowels that neatly slide away beneath the cabinet, clutter is kept out of sight.